Almost 100 years ago, eugenicists were very concerned with race mixing. In 1913, 29 states had laws forbidding mixed-race marriages, and 22 penalized for miscegenation — with fines and/or prison terms. Eugenicists actively supported the strengthening of old laws and the enactment of new ones such as the Virginia Integrity Act of 1924, which prohibited marriage between a white person and anyone with a trace of blood other than Caucasian. It took until 1967 for these laws to be dissolved. 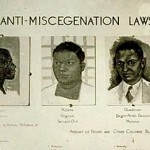 Visit the Eugenics Archive and explore the “Race Mixing and Marriage Laws”, “Mate Selection and Counseling”, and “Race and Ethnicity” topics, which are sadly rich with examples of these beliefs. Print article This entry was posted by Susan Lauter on September 24, 2010 at 10:52 am, and is filed under Eugenics Archive. Follow any responses to this post through RSS 2.0. You can skip to the end and leave a response. Pinging is currently not allowed.